TOTAL FLANKER...a rugby blog: Northern Lights? I have to say I was flabbergasted to hear the news coming out of Twickenham this week that the RFU is giving serious consideration to entering a team in next season’s Super Rugby competition. 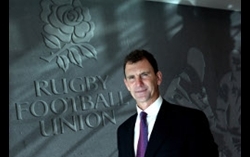 The audacious plan is the brainchild of new RFU CEO John Steele, who has been looking into the feasibility of such a move since his appointment in June last year. It is, however, the commercial success of last Sunday’s Crusaders v Sharks match at HQ, organised to raise funds for victims of the recent Christchurch earthquake, that appears to have accelerated the plans for a London-based franchise (with a working title, it is believed, of the “Northern Lights") to play in the elite southern hemisphere competition . The basis of the proposal, which is expected to be discussed at length by the RFU Management Board sitting in emergency session at lunchtime today, is that the RFU will centrally contract a number of English-qualified players, many of whom, it is believed, will have southern hemisphere origins. The idea is that not only will the RFU have solved the issue of player control overnight, they will also be exposing English qualified players on a regular basis to what is perceived to be a higher quality of rugby than the Aviva Premiership, while also fast-tracking southern hemisphere players into the England Elite Player Squad at the earliest opportunity. It is anticipated that current England squad members whose club contracts are due to expire in the next 12 months will be the first to sign up, whilst early indications are that former England and Lions supremo Sir Clive Woodward will be asked to be the new franchise’s Director of Rugby and that several southern hemisphere Rugby League players, currently plying their trade in Superleague, have been identified and approached. It is also thought that discussions are already taking place between the RFU and Melbourne Rebels for the release of Danny Cipriani from his contract. If the proposal is approved by the RFU it is expected that it will be rubber stamped by SANZAR, who are rarely known to look a gift horse in the mouth. nice try TF, unfortunately I think some will really want this to be true!! Any thoughts on the S15 game?